Sources: Use this chart with the Surname Index for additional information and sources. If something is underline, click on it and it will lead you to more information on that person. Shirley Nice Schuldt gave me a wonderful start on Thomas' family by directing me to Sangamon Co. IL where my family settled 85 years AFTER this DUNNUCK line lived here, which made researching this line very easy. Much to my surprise I found not only Thomas' children but descendants of Samuel's (b.1787) family as well. Illionis sources: Sangamon County marriage indexes, Sangamon & Logan Co., census data, cemetery indexes, biographical books, and obituaries at the Lincoln Library in Springfield, IL, etc. Virginia Magazine of History & Biography, volume V-25, beginning on page 425 publ. 1916 forward.. This article about the Gorsuch family, by John Hall Pleasants, was printed in a series beginning with V- 24, in 1916 through V- 27 in 1919. with corrections in V- 29, in 1921. 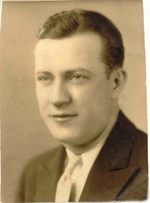 Cox family history, beyond that provided in the Keys papers is thanks to David S______, grandson of Hayes and Pearl (Dunnuck) Cox. Some data on the Kansas family came from the marriage and cemetery indexes found at the website: www.ukans.edu/~hisite/franklin/indexes. + Margaret GRIFFITH (they had 9 children) m. 31 Mar 1835 ** see sir name index for additional information on Margaret the number of children. d. Oct. 24, 1876, age 62 - bur. Hope Cemetery, Lincoln township, Franklin Co. KS. 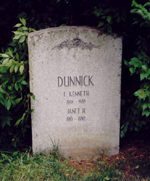 (near Ottawa) Spelled DUNNUCK in Cemetery index. 5. Nellie MANTLE (July 4, 1860 - April 5, 1875) d. age 14y 9 mos, 1 day. Eva, Frank, Keith, Floyd & Mantle all buried Mt. Pulaski Cemetery in Logan Co. IL (Cemetery index pages 104-5) - no wives buried with the boys. 1900 census listed as Frank J. - living City of Mt. Pulaski, Logan Co., IL - married 1 year, son Keith. 1910 census listed as John F. Prunty, age 40 - farmer b. IL, his Father b. KY, Mother IL, // Eva M 38 in IL, - married 11 years 4 children, 3 living. Thelma -10, Floyd 6, & Mantle 2. 1920 Listed as John F. age 52 of Chester township, Logan County, IL. wife & 3 children, Thelma, Floyd, and Mantle. Daughter Thelma & family living with them. 1930 living City of Lincoln, Illinois in Logan County. Ada 56 listed in Logan Co. IL census for 1930 living with George, Paul, age 31- no wife, and Noel, age 15. 1932 George, Ada, Paul & Noel moved from the Suedmeier estate to the residence of Mrs. E.C. Nolan at the corner of Cook and Marion St. in Mt. Pulaski, IL. Dr. E.C. Nolan died in Jan of 1932 - see below. . . . . Living with sister Alice in 1880 age listed as 31.
. . . .+. Michael STOLL, Franklin Co., KS 23 Feb. 1882 Book D, page 243. 5 Whose child is 3 yr old Frank DUNN*CK- listed as Emanuel's grandson in 1870 census? Barbara & Frank still living with Emanuel in 1880. Direct descendant thinks Barbara was the mother.
. + Lena (SCWARTZEL) b. Nov. 5, 1873 in MO -d. Dec. 2, 1962 age 89 Columbus OH. + Janet HOUSEHOLDER b. 8 March 1916-d. Dec. 10, 1998 age 82. Joseph d. 12 August 1962 in North Palm Beach, FL. Buried Union Cemetery, Columbus, OH. Mrs. 1964 now of Columbus OH. Not listed in 1930 census. buried in Union Cemetery next her grandparents, Frank & Lena. Sarah A. b. 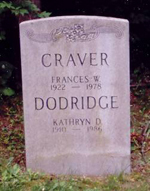 23 Feb. 1853, d. 29 Dec. 1936 buried Forest Rose Cemetery Lancaster, Fairfield Co. OH. 1900 family living in Hocking twp, Fairfield Co. OH, 1910-1930 in Liberty twp. Fairfield Co.
(Living in 1910 -- in 1920 census not with parents. There is an Elsie Milligan that died in Fairfield Co. June 26, 1915 - need to be checked out. d. April 1977 -- Newark OH. Tombstone has b. Sept 1879 - d. April 12, 1968 Forest Rose Cemetery, Lancaster, OH. Tombstone has DUNNICK so I assume never wed.
5. Clyde Landis DUNNICK., son b. July 23, 1881 in OH, living with widow, Sarah E. Dunnuck, Lancaster, Fairfield Co. OH in 1910, (1930 Clyde single - laborer- w/mother) d. 21 December 1953 buried Forest Rose Cemetery, Lancaster, Fairfield Co., OH. 4. Alice Webster -b. ca 1846 . Living in 1870 & 1880 with parents. Living with cousin Mary (Dunnick) SOLT in 1900. Alice is single no occupation. d.- 29 Jul 1889 ) bur Mechanicsburg, IL "died at home near Mechanicsburg"
1910 census for Sangamon Co. (Spfld.) IL. I find no record of any of them after 1910.
she d. 31 Jan 1983 in Los Angeles, Calif.
+ James D. EVANS m. Oct. 11, 1864 Sangamon Co. IL. In an article, publ. June 1876, James attends wedding of Elizabeth's brother Emanuel but she is not listed as attending. 5. Ruth E. EVANS b. between Dec. 1869 & Jan. 1870 in Logan Co., IL, (Middletown area) (Ruth 6 months on June 1, 1870 census ). 5. David G. EVANS b. ca 1868 - age 2 in 1870 census. The 1862 military Census lists a Thomas D. NOLAN, age 19 b. OH - Farmer of Logan County, IL. She d. 15 Oct. 1881 age 20 years, 4 months and 14 days. 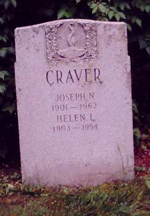 She is buried in Pulaski Cemetery, Section 1. (Emanuel's obit lists her as Mrs. Margaret Dillsaver and wed about 1902.
b. July 1882. Margaret and Emanuel did have children together. only child of Dr. Nolan - she was not married. Between 1910 & 1920 Elijah died and Elizabeth goes to California with son Edward. Elijah b. May 1844 in IL from 1900 census..
Elijah was b. Moultrie Co. IL May 14, 1844 Hampton Station, , Moultrie Co. IL, and he died 20 Jan. 1912, bur Mt Pulaski Cem. 6. child Source: (1917 draft registration list a wife & 1 child - Clyde b. 31 Aug 1888) b. Lincoln, IL living Indianapolis, IN. + Meta (DONNAN) (widow) BRAKA m. bef. 1918. May have been Daniel Wesley or Wesley Daniel. Daniel W.STOOKEY, age 70 & Angie also age 70 listed as together in the 1925 census for Cedar Rapids, Linn Co., IA. 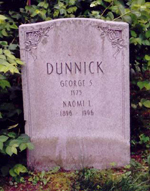 He lists his parents and Daniel & Caroline (GOODNER) STOOKEY and she lists here as Nicholas and Margaret (MANTLE) DUNNUCK. b. 28 May 1884, Buffalo, Sangamon Co. IL. b. 20 June 1886 Buffalo, Sangamon Co., IL. +Ruth A. GIBSON 3 March 1913 in Chicago, IL b. 14 July 1893 in IA, d. 25 May 1991. buried with husband. 1920 & 1930 living Thorp, Clark County, Wisc. 6. Daniel Wesley STOOKEY b. 6 Oct. 1913 in Wisc. 6. 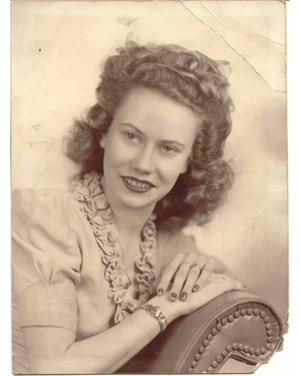 Carol Lynn STOOKEY b.4 November 1926 in Keystone, Benton Co, IA. + Wilfred LAMMERAND in Bato, FL in 1949. (No Children) Lived in Cedar Rapids. 1930 census James is 3 months old. High Point, NC. His father, Lewis is the director of Music at the public schools. 1917 listed as H.S. teacher in Belle Plain, IA per draft registration card. age 17 in 1920 census for Cedar Rapids, IA. Living at home. b. Aug 1, 1898,.Springfield,.Sangamon Co., IL. 4. E. F. Florence "Florence" "Flora" (Emma Flo ) "Aunt Fan Tail"
5. Helen C. HOY b. 1898 - d. 11/8/1981 age 83 of Spfld. IL d. St. Louis, MO. 6. Edward M. - PVT - auto accident d. 1945, CA. 4. Ruth DUNNUCK b.ca.1859 in Moultry Co., IL d. after 1896 Husband remarried by 1916. Where & when did she die? +Hayes "Haze" H. COX m. Nov. 19, 1895 in Franklin co. KS. 5. Harold Raymond COX (April 1,1900 in KS d. June 7, 1980 Harmony Cemetery, Beason, IL. + #1 Mr. V. K.